A 3-year-old boy presented as a Level 1 trauma patient after a high-speed, rollover motor vehicle accident in which he was an unrestrained passenger. He received cardiopulmonary resuscitation for 15 minutes in the field for pulseless electrical activity and was brought to our institution in critical condition. 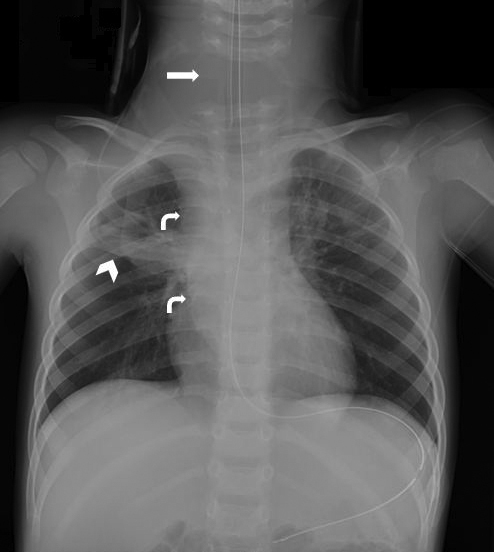 In the initial trauma workup, a portable AP radiograph of the chest revealed separation of the lower cervical vertebral bodies at the C6-C7 level, a widened mediastinum concerning for hematoma or CSF leak, and multifocal atelectasis (Figure 1). 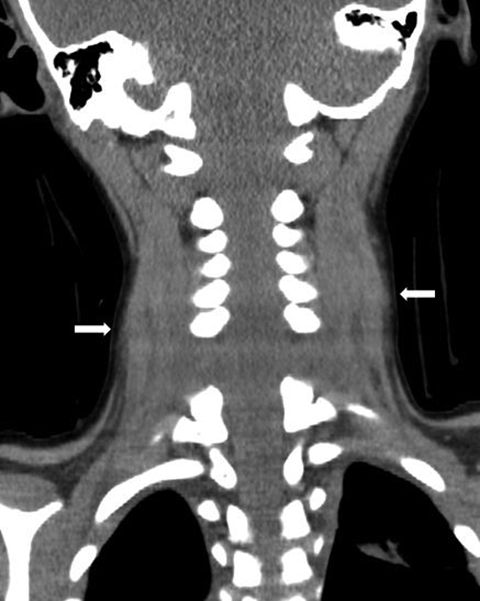 A coronal CT image demonstrated diffuse soft-tissue edema in the neck (Figure 2). A sagittal reformat (Figure 3) and 3D reconstruction in the coronal plane (Figure 4) revealed a C6-C7 distraction injury. Associated injuries not shown included complete transection fractures of the inferior endplates of C6 and the C6-C7 facets, diffuse cerebral edema and multiple facial fractures. Vascular injury was later excluded with CT angiography. MRI of the neck was then performed to evaluate the cervical ligaments and spinal cord. 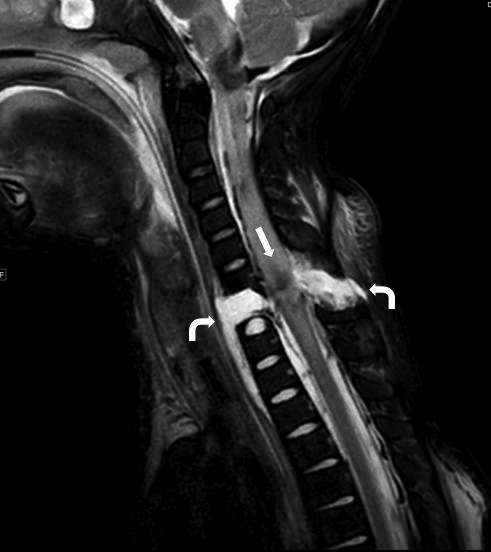 A sagittal TSE T2 MR image of the neck showed severe cervical spine injury with a large area of edema secondary to the C6-C7 distraction (Figure 5). MRI of the brain showed multiple areas of cortical and central gray ischemic injury and intracranial hemorrhage consistent with severe traumatic brain injury (not shown). 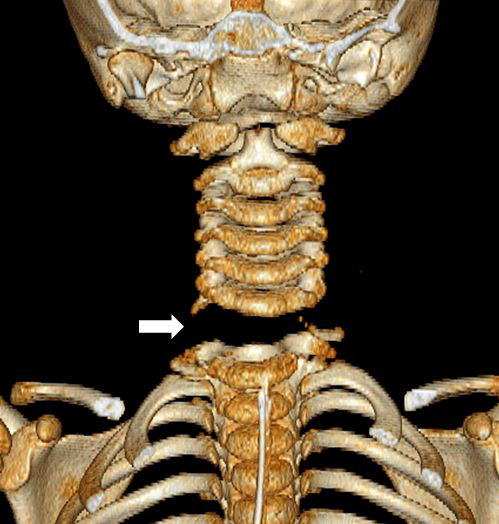 Traumatic cervical spine distraction injury at C6-C7. The differential diagnoses for this injury include facet dislocation and pseudosubluxation. The level of cervical injury is often characteristic of the patient’s age. Younger children have disproportionately large heads and comparatively weak neck muscles; therefore. the fulcrum of cervical motion is at the C2-C3 level, which leads to upper cervical injuries. 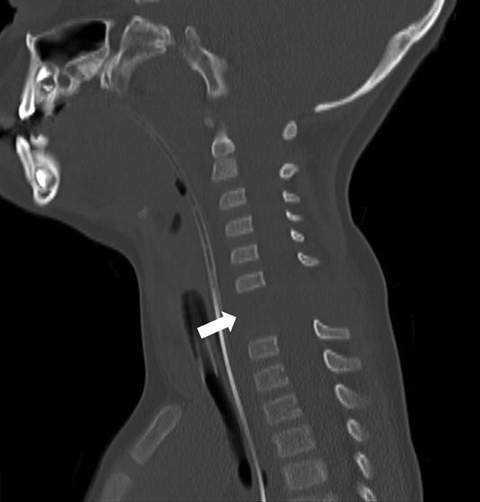 In adolescents, injuries are more common at the lower cervical levels because the fulcrum of cervical motion lies at C5–C6.5,6 Thus, the location of a C6-C7 distraction injury in a 3-year-old, as seen in our patient, is exceedingly rare. Ligamentous and bony fractures of distraction injuries typically result in severe spinal cord injury, which can present as neurogenic shock. The classic triad of neurogenic shock includes hypotension, bradycardia and hypothermia. Due to the high-velocity mechanism, traumatic brain injury and associated fractures elsewhere in the body are common.7 Our patient suffered severe traumatic brain injury as well as neurogenic shock at presentation, requiring vasopressor support for several days after admission. Cervical spine injuries are common in the pediatric population due to the unique biomechanics of the head and neck in children. Upper cervical injuries are more common in infants and young children while the lower cervical spine is more often injured in adolescents. The most common mechanism of injury is motor vehicle accidents, and the mortality rate of these injuries is not insignificant. A multi-imaging modality workup is often necessary to fully evaluate the extent of injury. Treatment is typically nonoperative, though there are indications for prompt surgical intervention. Cirak B, Ziegfeld S, Knight V, et al. Spinal injuries in children. J Pediatr Surg. 2004; 39:607-612. Silverman A, Amed N. (2009) Traumatic pediatric cervical spine craniocaudal distraction injury. Injury Extra. 2009; 40:4-5. Mccall T, Fassett D, Brockmeyer D. Cervical spine trauma in children: A review. Neurosurg Focus. 2006;20(2):E5 http://www.medscape.com/viewarticle/527718_7. Dogan S, Safavi-Abbasi S, Theodore N, et al. Pediatric subaxial cervical spine injuries: Origins, management, and outcome in 51 patients. Neurosurg Focus. 2006; February 2:1-7. Hill S, Miller C, Kosnik E, et al. Pediatric neck injuries. A clinical study. J Neurosurg. 1984; 60:700-706. Nitecki S, Moir CR. Predictive factors of the outcome of traumatic cervical spine fracture in children. J Pediatr Surg. 1994; November 29:1409-1411. Carreon L, Glassman S, Campbell M. Pediatric spine fractures: a review of 137 hospital admissions. J Spinal Disord Tech. 2004;17:477-482. Ghanem I, El Hage S, Rachkidi R, et al. Pediatric cervical spine instability. J Child Orthop. 2008;2:71-84. Traumatic cervical spine distraction injury. Appl Radiol. Prepared by Dr. Robinson while at the Department of Radiology, Mayo Clinic Hospital, Phoenix, AZ; Dr. Jorgensen and Dr. Richard Towbin while at the Department of Diagnostic and Interventional Radiology, Phoenix Children’s Hospital, Phoenix, AZ; and Dr. Aleander Towbin while at the Department of Radiology, Cincinnati Children’s Hospital, Cincinnati, OH.